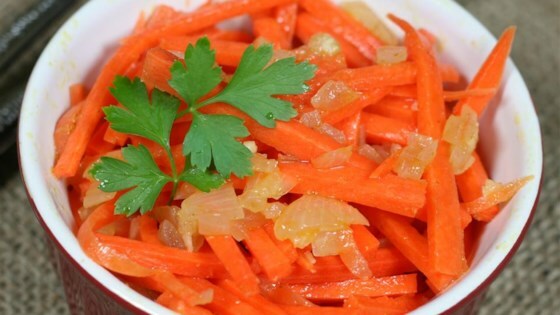 "Russians call it 'Korean Carrot Salad,' but it is so absolutely ubiquitous in Russia that if they didn't originally own it, they certainly do now. Coriander provides primary flavor; cayenne provides the heat. To get it right, you MUST use a mandoline to julienne the carrots into long, thin strands like spaghetti. To save time, buy them already julienned at the grocery store. This dish is best after it has marinated for 24 hours, but is fine after only 4 or 5 hours." Place carrots in a large bowl. Sprinkle garlic over carrots. Mix vinegar, sugar, and salt together in a small bowl. Heat oil in a skillet over medium heat. Cook and stir onion in hot oil until soft and translucent, 5 to 7 minutes. Stir coriander and cayenne pepper into the onion; add to carrot mixture and toss. Pour vinegar dressing over carrot mixture; toss to coat. Transfer carrot salad to a dish with a tight-fitting lid, cover, and refrigerate 4 to 24 hours, tossing salad several times while it marinates. Way too much salt. I followed directions to a tee and it came out too salty. Use lemon juice instead of salt. It's still very close to a flavor of a carrot salad I used to buy in Russia. Turned out great, very close to what I’ve had in Russia. I would cut down on the salt and vinegar because it turned out a little more sour and salty than what I’m used to. Overall, good recipe! I did as other reviewers suggested and reduced the salt. It turned out great!